Thanks, Stuart, for agreeing to do this quick interview. Mind you, this is by far and away not your first. I asked one of the other writers on the anthology this question, but it applies in spades to you – do you ever get used to doing these things? Is there a danger in getting too blasé about the whole PR thing? Being relatively new to the games industry, I’ve not had a chance to get used to doing PR, as such. I still find quite amazing that people want to hear anything that I have to say! But I also think that interviews can perform an important role in bringing you back to your audience. I think it is important to try and connect, and I certainly appreciate an opportunity to revisit a piece of work or talk about writing in general. For those few souls out there who are unaware of who you are, who are you and what do you do? I lead a double-life these days: by day I am a mild-mannered teaching fellow at Strathclyde University and by night I freelance as a writer for a number of different game publishers, including Cubicle 7, Sixtystone Press, Chaosium, RealityBlurs, and, of course, Mr. Iain Lowson. I’ve also recently taken on the job of line developer of the Cthulhu Britannica line at Cubicle 7, so my plate is pretty full. What is involved in the position of Line Manager? Line developing means bringing all the legacy projects that existed before I joined Cubicle 7 to life while looking ahead to what the Cthulhu Britannica line could and should be. It’s a lot of managing materials, editing for quality, coordinating with art and layout, and generally making sure that things get done and to a high standard. What matters most to me is that the line grows consistently and solidly with interesting books and supplements that people want to play. You’ve won everything of late, except the 100m sprint at the recent Olympics (which was nice of you; Bolt would’ve cried or something). At the same time as creating all the amazing Scottish Cthulhu material (books, not cloth), you have another full time job in education. How on earth do you structure your time? As best I can. To be honest much of my time is spent in a kind of ‘creative chaos’ and I just move from one deadline to the next. Now that I am line developing material, however, I am working with deadlines other than my own so I am beginning to develop a pattern and it seems to be working. The greatest danger for me at the moment is overload. That’s something I need to be careful of. As has been mentioned, you’re hitting the headlines with the Shadows Over Scotland book and the related scenario. You’re clearly no stranger to horror. Equally, DH:LoF is a little different. What for you are the challenges of each? The biggest challenge is trying to meet the expectations of your audience. With Shadows Over Scotland, my intention was to write the best Call of Cthulhu sourcebook for 1920s Scotland that I could. Having played the game myself for decades, I had a good idea of what I would want to see, but you’ve still got to be careful to write for a wide audience. 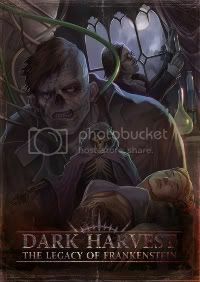 With Dark Harvest: Legacy of Frankenstein, I didn’t have the same familiarity to call on, but what I did have was a wonderfully described setting, both rich and detailed. In that case, you are looking for reference material and trying to match the quality of the content and the writing. When did DH:LoF first come to your attention? I think I spied it originally when it first came out, but I didn’t have a chance to play it until some friends I know picked it up. I remember be struck by the Frankenstein concept. It was a very original setting for gameplay. When the invite to participate in the anthology came in, what made you agree to contribute? Was there a story already in your head, or did that come later? The strength of the setting and how evocative it is was what made me agree. The story behind ‘A Rending Crack of Thunder’ wasn’t in my head at the time, no. It was a product of the creative chaos I talked about earlier. I really enjoyed writing it. Without spoiling the tale, give us the teaser version of ‘Rending Crack of Thunder’. It’s a story about brotherhood and betrayal, both in a familial and a national or patriotic sense. It is underscored by the idea of resistance, of power, and of the relationship between dominant and counter cultures. But at its heart is a tale about two brothers who see the world very differently. What’s next for you with the writing? I am just finishing up a scenario for Sixtystone Press and I’m developing the manuscripts for Cthulhu Britannica: London. I have another big sourcebook project to begin in the new year as well. On top of that there will be regular output from the Cthulhu Britannica line throughout 2013. It’s Christmas! What are your plans? To relax, actually! I’m going to take some time away from writing and just enjoy the season. No plans to travel, just staying in and keeping warm. Thanks for doing the interview. What are you off to do now? I’m having a new boiler installed, so I’ll check on that, but then it’s back to writing. The excitement never ends! Ciprian looked down, glancing at the fire, his eyes focusing on the flames slowly curling around the blackened glass of the cognac bottle. Ciprian looked up to his brother. “Conscience,” he admitted. Ciprian retrieved his handkerchief from within his silk dinner jacket and mopped the sweat from his brow, avoiding his brother’s dark eyes. Ciprian looked at his brother, realizing suddenly that he had said too much. Ciprian grew still, his eyes widening with fear. Ciprian remained silent, not knowing what to say. “You will never escape it….